In the pharmaceutical industry, compressed air is used for a number of production and packaging applications. In pharmaceutical manufacturing, testing and monitoring of compressed air gases such as nitrogen, oxygen, argon, and carbon dioxide that come into direct contact with pharmaceutical products is vital to assuring the quality and safety of those products. In addition, compressed air used in the manufacturing process should be monitored and controlled to prevent the risk of a contaminated air supply coming into contact with a product. 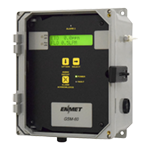 Furthermore, ENMET’s compressed airline monitors for process or breathing air provides continuous monitoring of a compressed air supply to ensure the quality and safety of the compressed air system. Because our ProAir 2200 process airline monitor can continuously and simultaneously monitor up to four gases in real-time. Our system can be custom configured to monitor a variety of hazardous gases and dew point using internally mounted sensors. ProAir 2200 is a compact, easy to install and operate compressed airline monitor that can continuously and simultaneously monitor up to four gases in real-time using internally mounted sensors. The GSM-60 is a versatile instrument, which, in addition to having an internal sampling pump and sensors, can also accept inputs from remote gas sensor/transmitters.